When we moved to our current house 5 years ago my boys were 2 & 3 years old. They shared a room, and still do, because I insisted that the other bedroom should be a guest room. I was convinced my family and friends from back home in California would come visit a lot. Well, my mom comes 2 or 3 times a year and occasionally our buddy Brittain stays so late he sleeps over. All in all not a lot of usage. 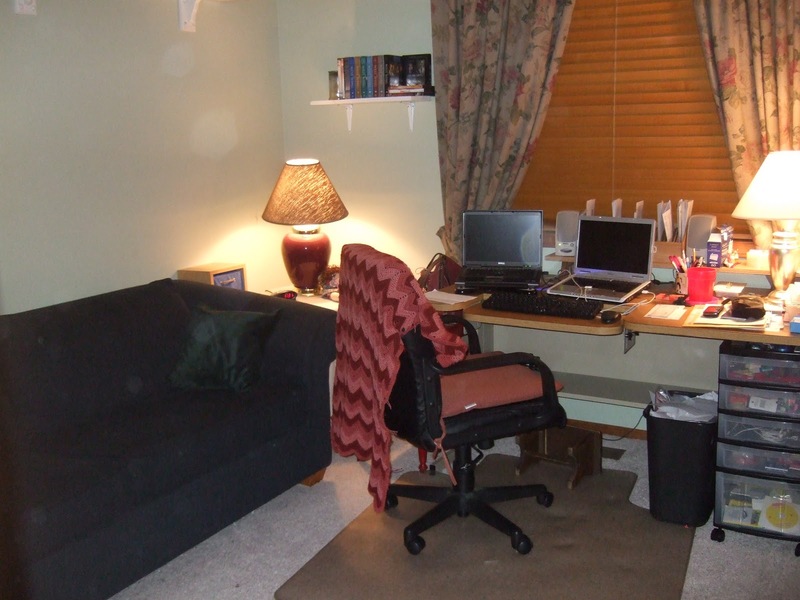 I have always had a workspace of my own, but my desk was tiny and it had been shuttled from room to room whenever I needed to make space for something else. First it was in the toy room/animal room/catch-all. Then a corner of the living room. Then our bedroom. I never had a space where I could really put my stuff out and let it just be. Then I got a docking station and laptop for work and sadly the contraption didn’t even fit on my tiny desk. Obviously something needed to change. Enter my husband. Sometimes he has the best ideas. As I was lamenting my lack of space he simply said, “why do we need a dedicated guest room? Let’s turn it into your office and just move the hide-a-bed couch in there in case we have guests.” And it was as simple as that! Brilliant! Well, not quite so simple – but nearly. First we moved the queen size bed to the garage in pieces. Then I took stock and figured out what I would need to make this nearly bare room into an office and we headed out to the thrift stores. Yes, thrift stores. I ended up getting a new desk for $27 and a new lampshade for $1.50 to go with a hand-me-down lamp and shelf. 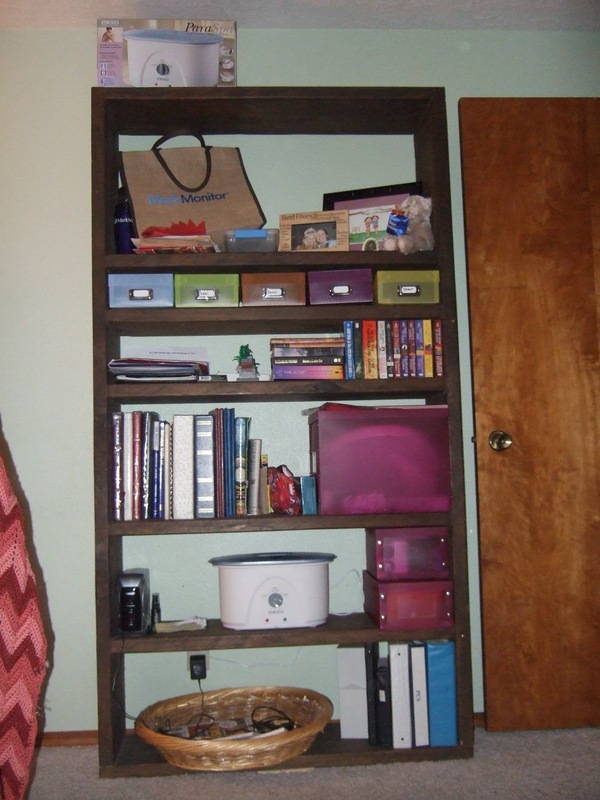 I already had an old file cabinet and a shelving unit my uncle built with his bare hands a long, long time ago. The only thing I bought new were some storage boxes and a rolling cart of drawers. The storage boxes I got at Ross on clearance for a steal. I love a good deal. I moved everything in and got it setup over the space of a couple weekends. It was nighttime when I took this pic, but I also have a wonderful view of my front yard. I have several times banged on the window when I caught my kids climbing on top of cars in our driveway or dodging cars in the street. They are boys. I don’t have a better explanation for it. They DO know better. I’m so happy to say that I now have a room of my own. Shortly after moving into my new space I started this blog. Coincidence? I think not. Thank you for the inspiration, Ms. Woolf. Maybe when I have money I can write fiction, but for now you get me and my laptop composing the narrative of my days. I need a space. It's the kitchen table and if we had an office… it'd probably be Matt's. The baby sleeps in our bed. I should just steal her room. 😉 Enjoy your spot! First…I love Virginia Woolf!Second…We put our boys in the same room last year. 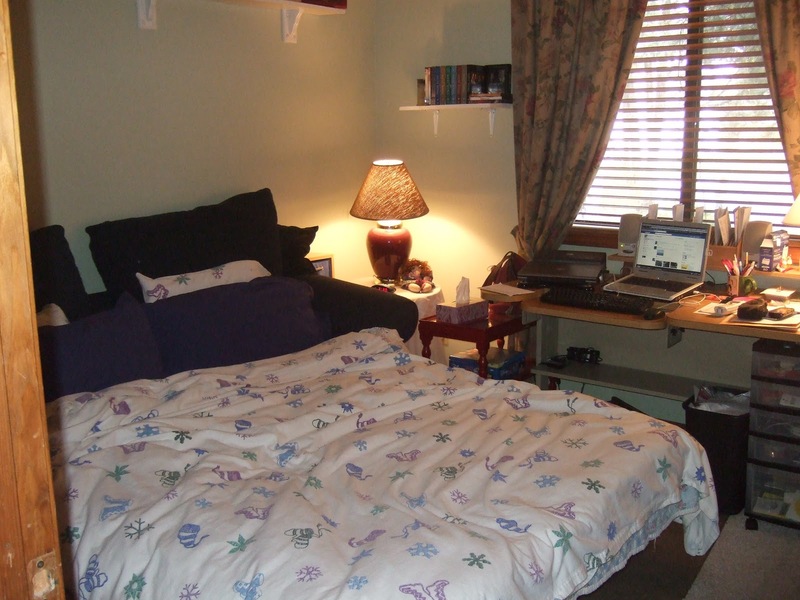 I moved into the spare bedroom and just as I was getting settled in we got our Au Pair and I was forced to get out. I am convinced every mother, particularly one who is outnumbered by males, must have a room to herself. I am glad you're enjoying the room! Hugs!